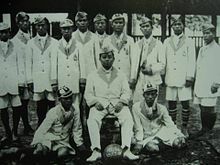 Members of the very first Thailand national team squad. Thai team at the 1956 Olympics, Melbourne before its biggest defeat by the United Kingdom. ໜ້ານີ້ຖຶກແກ້ໄຂຄັ້ງລ້າສຸດເມື່ອວັນທີ່ ໘ ມັງກອນ ໒໐໑໗, ເວລາ ໑໔:໐໓.